Find the answers to your CSA questions here. CSA stands for community supported agriculture. With a Penn's Corner Farm Alliance CSA, you are supporting nearly 30 area farms with your food dollars by committing to a weekly delivery of the freshest, locally grown food to a convenient neighborhood pickup location. Our CSA is available year round with spring, summer, fall, and winter shares, or the Farmers' Friend that spans 32 weeks from spring through fall. With a CSA membership, you will support nearly 30 area farms while receiving delicious products, along with weekly recipes, and cooking information on our blog. Penn's Corner offers two different sized shares for the Spring, Summer, and Fall CSA. Standard shares will contain 6-10 different items and Small shares will contain 5-8 items. An item is a 1 lb bag of potatoes, a bag of apples, 4 ears of corn etc. Check out our sample shares for pictures of what was in last year's boxes! What at the lengths of the CSA shares? Weekly is the best value option, biweekly (every other week) is available for the Farmers' Friend and the Summer shares. How much does a CSA box cost? Please refer to the add on shares page here for pricing for egg, cheese, and flower add on shares. CSA pickup times will be confirmed closer to the beginning of the season. Pickup days will be on Wednesdays for the 2019 season. The pickup times vary by location. For current information on pick up locations, please check our complete list click here. What if I can’t pick up my box during the allotted time? It is important to find a way to get your box during the stated time frame. If you cannot get to the pickup location on time, we suggest sending a friend or family member in your place. It’s a great way to introduce the CSA to others. We cannot guarantee that CSA boxes will be available outside of the stated pickup time. If you do miss your pickup, please contact your site host, or email csa@pennscorner.com so that we can contact the site host and see if we are able to make arrangements for a late pickup. Yes! If you know about a vacation in advance you can schedule a "vacation hold." We will not pack you a share that week and you can: request two boxes for your next delivery, make up the box on a different week (if you get a biweekly share), or you can opt to donate your box. We do not give refunds for weeks you miss due to a vacation. All vacation hold requests and make up/double box deliveries must be submitted by Thursdays at 5pm for the following week. If you submit your vacation hold after the deadline you will not be entitled to a make up box. To request a vacation hold, login to your account, click subscriptions, click put subscription on hold, select the dates for your vacation hold, then email csa@pennscorner.com if you want us to donate your box, schedule two boxes for your next delivery, or schedule you a box on an off week. Are there any add on shares available? Yes! You can add on an egg, cheese, or fresh flower bouquet share! For more details click here. New this year, one of our CSA options is an all organic harvest share option spanning 24 weeks. All produce will be provided by our member farms that organize under the name Clarion River Organics. Our regular CSA is not certified organic, but many of our farms that are not certified organic follow organic practices and principles. We will note each week which farm's products are organic on the weekly preview email. Where is the CSA food coming from? 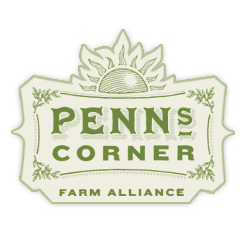 Penn’s Corner Farm Alliance is a cooperative of Southwestern PA farmers that market together in the Pittsburgh area. PCFA farms are in Allegheny, Washington, Beaver, Butler, Mercer, Armstrong, Indiana, Cambria, Clarion, & Westmoreland counties, among others. You can view a complete list of our farmers by clicking here. CSA produce comes directly from the farms to your neighborhood. The produce is harvested and packed on our member farms on Monday or Tuesday, packed into CSA boxes in our Lawrenceville warehouse on Tuesday afternoons, and taken directly to your CSA pickup location on Wednesdays! Can I choose what’s in the CSA box? At this time, there is not an option to choose what’s in your CSA box. We do, however, have the option for a vegan and a gluten free CSA. Other than that, we believe that with good recipes (which we provide on our blog), you’ll learn to enjoy the diversity of produce in the CSA. Most members find new favorites in the CSA box. If there are additional produce items you'd like, please take a look at our Online Farmstand to supplement your CSA box! How can I find information about cooking the produce in the CSA box? The weekly CSA blog post always has recipes related to the specific items in each box. In addition to that, the internet is filled with wonderful recipes based on seasonal produce. Yes, we are looking for members who are willing to be a pickup location for CSA deliveries. Please let us know your address, and we can assess the possibility of adding your location to our delivery route. We are currently looking for hosts in the Strip District, East End, and Wexford. What is required to be a host site/pickup location? The short answer is, not much. It can be at your home or business. The CSA boxes simply need a cool, protected place that is easily accessible to members. You are not required to be present during the pickup, but it is necessary to provide contact information in case we need to reach you. The members will return their empty boxes to the pickup location, so it is also necessary to have a bit of storage space for the CSA boxes. We typically accept sites with room enough for 10-20+ boxes (approximately 17”x 13”x 11” each). Please inquire, we can send your our Statement of Understanding for CSA hosts. Do you accept SNAP benefits as payment for a CSA share? Yes! You can pay with your EBT card if you pick-up at our Lawrenceville warehouse. 4. Select your preferred location and choose your CSA option. (You can only view the CSA options if you select one of the CSA Locations). Email csa@pennscorner.com for any additional questions!